Situated at Badi Choupad, Pink City of Jaipur, Hawa Mahal was built in 1799. It has 953 windows on the outside walls. The honeycomb shaped and beautifully carved windows allow breeze to blow through the palace and makes it a perfect summer palace. It was built as an extension to the City Palace nearby. See below for more information about Hawa Mahal. In 1799, the Kachhwaha Rajput ruler, Sawai Pratap Singh, grandson of Maharaja Sawai Jai Singh ordered Lal Chand Usta to construct an extension to the Royal City Palace. The Purdah system at the time was strictly followed. Rajput royal ladies should not be seen by strangers or appear in any public area. 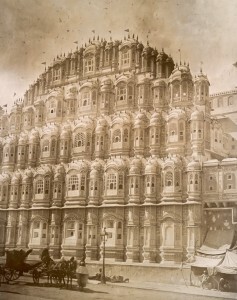 The construction of Hawa Mahal allows the royal ladies to enjoy from every day street scenes to royal processions on the street without being seen. The five-stores palace was built in the form of Krishna’s crown because Sarai Pratap Singh was devoted to Krishna, the Hindu god. The mahal has a total of 953 small casements each with small lattice worked pink window, balconies and arched roofs with hanging cornices. This allows cool breeze blow through the mahal and keep it cool and airy in summer. Despite the large number of windows, each of them are size of a peep hole such that the royal ladies were not to be seen by the public. The top three storeys are a single room thick, namely Vichitra Mandir, Prakash Mandir and Hawa Mandir. The Maharaja worshipped the Krishna at the Vichitra Mandir. while the Prakash Mandir provides an open terrace to both sides. Worth noting is that there are no steps to the upper floors but ramps. They are for the palanquin of the royal ladies. The autumn celebrations took place on the Sharad Mandir on the first floor. Don’t miss out on the colourful glassworks on Ratan Mandir on the second floor. Contrast to the rich decoration of the exterior, the interiors of the mahal is much simpler. But it is also where you will find the best view of the city of Jaipur. The best time to visit Hawa Mahal is in the early morning when the sun enters the rooms from the windows. The mahal is illuminated with golden sun lights. Please see the opening hours of the mahal here. entrance fee and composite ticket details can be found here.